This fall, my one and only little sister joined the ranks of thousands of American college freshmen, as did my one and only girl cousin in my mom’s family. Now, from years of camp and college, I know that it is always a welcome surprise to receive a care package – especially a care package containing food. So, I promised them that I would bake for them. This cookie is for my sister, who requested something containing COCONUT. Now, I have yet to find an actual cookie made with coconut that I really like – so I just invented my own, inspired by Bounty. 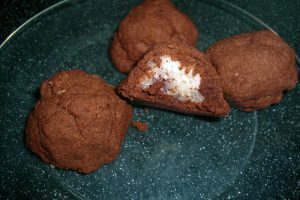 Originally, I was making a recipe from the Gourmet Cookbook by Ruth Reichl for something called “Snowballs”, but when those ended up being just ordinary macaroons, I decided to spice things up a bit by encapsulating them in chocolate dough! 1. Preheat the oven to 350oF. Line 2 baking sheets with parchment paper. 2. Either finely chop the coconut or pulse it in a food processor until it finely chopped. Place in a bowl and stir in the sugar and salt until they are well mixed. Then stir in the egg whites and water until well mixed. 3. With damp hands, scoop 1 tbs. sized mounds of coconut. Roll into balls and place on the baking sheets, about 1″ apart. Bake 13-15 minutes, until the balls are puffed but not coloured. Slide them on the parchment onto a wire rack to cool completely. 1. Preheat the oven to 350oF and line 2 baking sheets with parchment paper. 2. In a double boiler over gently simmering water, melt the unsweeteened chocolate. Let cool slightly, then beat into the softened butter until well-blended. Beat in the sugars until they are well-mixed in, then add in the flour and baking soda. 3. Take out a tablespoon-sized lump of dough and pat it as thin as you can between your hands,about 1/16″ to 1/8″. Place a coconut ball in the middle and pull the dough up around it so that it is completely encapsulated. Put the chocolate covered coconut ball on one of the prepared baking sheets. Repeat until all of the balls are covered, spacing them about 1″ apart. 4. Bake for abouut 10-12 minutes, until the outside of the dough feels firm. Remove from oven and transfer to wire racks to cool completely.